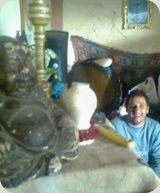 We are beginning the Dalit Buddhist volunteer program in East-European Roma communities in september 2009. 2. Running workshops and training camps for Roma/Gypsy activists. Throughout Central Europe there are substantial numbers of Romas/Gypsies. This community is originated from India – first data about their arrival to Europe occur around 1300 AD. Members of this ethnic minority are almost all suffering badly from strong discrimination which has ensured that their economic and social situation is very backward. In effect they are living in third world conditions in the midst of new EU countries that are emerging from the communist system. By and large the end of that system has led to the rapid deterioration of their situation, already bad enough, since the communism at least guaranteed full employment of a sort. Although the Hungarian constitution gives full rights to Romas/Gypsies, and even provides special political safeguards, in many areas there is still active resistance from the general population to Romas/Gypsies enjoying their rights. The political system is manipulated to continue the centuries-long exclusion and segregation, ensuring that most still live in what are effectively ghettos. Most Romas/Gypsies do not have the education and confidence to bring effective change. There is very little sympathy and help from wider Hungarian society. The situation is nevertheless better in Hungary than in other East European societies: Gypsies are more integrated here than in Slovakia, Roumania or Bulgaria. A higher proportion of them makes compulsory eight classes in Hungary than in other countries, however there are not many who continue in higher education or at least in secondary schools. Hungarian Romas have even gained some political influence too: both Roma members of EU Parliament in Brussels (Mohácsi Viktória and Járóka Lívia) are from Hungary. Hungarian Romas’ organizations can provide patterns and support to other east european Roma communities. Therefore Hungary is a good starting point for strategic work within Gypsy communities in East Europe. After the fall of the communist system the possibility arose to set up religious organisations. About 11.000 Hungarian people offer 1% of their annual tax to the Buddhists, while around 440.000 people offer it to the catholic church, 220.000 people sponsore the protestants. These figures are due almost solely to a century of buddhist presence in the Hungarian upper middle class society, because there has not been any massive asian immigration yet in the east european countries. The Buddhists have a social activity from the outset: they are amongst the founders of Gandhi Grammar School in Pécs, which was set out in 1992 mainly for Gypsy youngsters. The work of this secondary school is remarkable in the whole East-European social context because it has performed a successful pedagigical attempt which is tangible and acceptable for the regional pedagogical public opinion. The objective of giving secondary and higher education to hundreds of Roma youngsters has become a touchable reality: whoever wants, can try to do it following the example of Gandhi school. There are such initiatives in Slovakia and in Roumania - „Gandhi” label is used in both countries. It shows the attraction and strength of the symbols related to India within Roma strategies because of the strong awareness of indian origins of Gypsy people. The Little Tiger High School organized by Buddhists in a Roma/Gypsy village (Alsószentmárton) in South Hungary has been working for four years. This school gives the opportunity for further study in villages where the population’s educational level is extremely low. The main objective of the school is to help young people who live in highly segregated situation to find their way to social integration.Therefore the key word of the idea is GCE „A” level. Amrita is a Roma youth organisation in Pécs. This is a self help group set out in 1994. 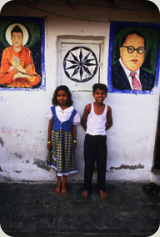 Their community house is run by Gypsy students and young intellectuals influenced by the thoughts of Dr. Ambedkar. Amrita is a good network of poor Gypsy students and pupils without a strong background. EU programs or hungarian government officials sponsore it sometimes on a high financial level but never for long time. Amrita is presently seeking a larger international network in order to consolidate its work. The long lasting buddhist links provide the most attractive perspectives for the activists. Five Dhammamitras, Janos Orsós, Tibor Derdák, Anikó Orsós, István Benő Lázi, László Kalányos all working in these above mentioned organisations, are leading figures in this work among the Romas/Gypsies. They set up a proper organisation directly for this work, entitled ‘Jai Bhim’ Relgious Network, linked to TBMSG and FWBO. 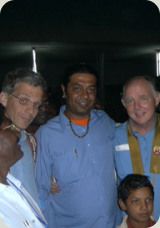 J. Orsós and T. Derdák went twice to India and attended the Dhamma Revolution Retreat in Nagpur, which was partly sponsored by Karuna, and visited TBMSG and Bahujan Hitay projects in Maharashtra. A. Orsós and I. B. Lázi went to Birmingham in 2006. and spent some weeks in FWBO community. They realised that the work in India provided an important source of example, inspiration and guidance for their work in Hungary, and potentially elsewhere in Central Europe. Dr. Ambedkar’s emphasis on self-help and ‘Educate, Agitate, and Organise’ very much fitted in with their own approach, while his call for Buddhist conversion as a means of social, economic, and personal development showed how Buddhism could be relevant to the problems faced by Roma/Gypsies. East-european Romas/Gypsies are deeply conscious of their roots in India and many of them identify strongly with what happens in that country. They set up in 2007. the Dr. Ambedkar High School in some very poor Gypsy communities in the North East of Hungary. The seat of the school is in the largest hungarian town where the majority is being Roma/Gypsy – Sajókaza. The president of Hungary Sólyom László visited the school in october. Mr and Mrs Singh from the Embassy of India greeted the students at the occasion of Dhammadiksha on the 14th October 2007. Dhammachari Subhuti came in January 2008. Dhammachari Paramashanti is spending the whole year of 2008 in the school. 1. We play important roles in some above mentioned educational initiatives: encouraging young Romas/Gypsies to complete secondary and go on to tertiary education. a. The Dr. Ambedkar Buddhist High School works in Borsod County, for rural Gypsy communities in North-East Hungary, where less than 1% of the Roma population have finished secondary education and none have first degrees. The new school created a stir in the community: we have at once 100 students in communities where secondary school was not known. It is worthy of remark that Buddhists have been the first to set out secondary school activity in the large segregated rural Roma communities of Hungary. Therefore the school has been taken as a model by the Hungarian educational ministry. We are actually helping to establish a number of new schools throughout Hungary on the same basis in a fruitful cooperation with christian churches. The pilot role of east european buddhist grammar schools in looking for solutions for such a hot local social problem can highlight the global importance of Dr. Babasaheb’s conception. The principal of the school is a former MP, a new dhammamitra (Derdák Tibor). 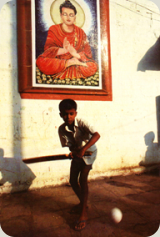 Activities managed by Dalit activists like karate teaching, english training, science shows, human right courses, non-violent communication, Dhammaduta, indian civilisation course are welcome in the school. b. We have set up the Amrita Assocation in Pécs, which provides support and training for young Romas/Gypsies. Amrita is a well known, very good brand name among the hungarian Gypsy organisations, this is the largest Roma student network of the country, abundantly sponsored by EU. Its role in the hungarian roma youth context highlights also the value of Dr. Babasaheb’s conception. The main activists are dhammamitras Orsós János and Orsós Anikó. Amrita organisation can be a natural framework for activities like karate teaching, english training, science shows, human right courses, non-violent communication, Dhammaduta, indian civilisation course – managed by indian dalit volunteers. c. We have strong connections with communities in the North-East part of Hungary where local activists initiate the same kind of work. Hetefejércse, Jánd, Abaújkér (a methodist grammar school which has been set up following the same model). Miskolc is the third largest city in Hungary. The local council was sued for segregation of Roma pupils. Chance for Children Foundation (CFCF) won the case with Dr. Lilla Farkas avocat, Mohácsi Erzsébet president, Újlaky András organiser. This is the first sentence in Hungary which has been condemned a municipality for segregation. Lázi I. J. B., Orsós János, Siroki László and Derdák Tibor were eminent activists of this historical verdict. Hajdúhadház Another historical verdict won by CFCF obliges the local government to apologize the Roma community for segregating them, and to stop segregation. Jászladány: the mayor has manipulated the system to ensure that Roma/Gypsy children are effectively segregated in a separate and inferior school. Our friend here (Kállai László) is a very famous Roma activist who has stood up to exploitation using non-violent protest on the footsteps of Mahatma Gandhi. Last spring Orsós János and Kállai László went to the USA together at the invitation of the State Department to get some support and training in their human right struggle. training of activists: the success of Dr. Ambedkar’s movement has given a strong inspiration to some Roma activists. They express a keen interest to know more about it. Their eagerness is surely connected to the awerness of their own indian origins and to the similarities of Dalit lot with Gypies plights. The dark skin colour of Gypsies, as a basis of racial dicrimination in european societies, motivates also the interest of Roma people to know more about the World’s largest democracy, where people are very similar to them. There are always questions about the Dhamma, because people want to uderstand what refuge Dalit communities have found. Members of Roma communities want to have authentic sources of information about the Third World and especially about the human right movement of the oppressed people in India. Addressing a wider public. The human right work is not a segregated work within the communities, but aims first of all the whole Hungarian society. The Buddhist background is an excellent starting point for this, as it is a par excellence upper-middle class phenomenon. Our community work has arisen the interest of the three most important banks of Hungary (like Raiffeisen Bank). 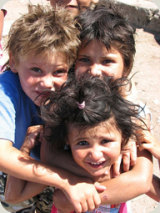 They support individual Roma pupils in the framework of a long term program proposed by us. We could reach other religious (christian) denominations through the government program of spreading the High School model to other places. Such a fruitful cooperation is important to consolidate our own work in the hungarian social context. Even this very project of calling indian Dalit community activists to help Gypsy communities seems to be also appealing to some social partners in Hungary. En fin de compte 90% of the hungarian society is practically a western social structure. Our civil society, our NGOs have been crippled by a long history of various totalitarian dictatorships, but our suddenly began democratisation can be more effective than in a poor country. There is no tradition of private sponsoring of any NGO or religious projets in Hungary but democratic patterns are appearing quite quickly. We are finding step by step the hungarian patrons for the work with people in „Third world situation” within our country. Maybe the Tsunami was the first occasion when middle class Hungarian public donated important sums to South Asia: the Baptist Church (which has about the same size in Hungary as the Buddhist one) builds a christian orphanage in Sri Lanka (Hungama – near Colombo). We appreciate highly the work of our baptist friends, but we would like to represent Dr. Babasaheb’s movement as an authentic actor in social work within communities in „Third world situation” either in Roma or in Dalit communities. We want to bring four activists from the Dalit community to Hungary for a period of one year. We have already seen from the visits of Indians such as Dhammacharis Manidhamma and Karunashur that the presence of Indians from Dalit communities has an inspiring and educating effect on Hungarian Romas/Gypsies. They feel an immediate affinity with people who share the same skin colour and features and probably ancestry. They are more willing to learn from such people, who will also have a similar social and cultural experience and at the same time the vision, tools and experience to transform it. What has happened in India is an important example of how social development can take place. This will not however be a one-way process. For such Indian activists working in Hungary will be a source of new inspiration and confidence. For them to be effective and to be appreciated outside their own community and in the West will be a new and valuable experience. Once this is known about in India it will also be a very great encouragement to the wider Dalit community, who need a great deal of support and confidence to continue their struggle for development. We consider this to be as important a part of the project as the benefit to people in Hungary. The four volunteers arrive to an organized hungarian host structure. They can get food and accommodation in our structures without paying. Nevertheless we provide them their own money, and some budget for their activities like karate teaching, english training, science shows, human right courses, non-violent communication, Dhammaduta, indian civilisation course. Hungary has never been an english colony, therefore Hungarian people don’t speak english. Hungarian life-style is very far from indian standards: rural people have never seen someone who does not eat meat, does not drink alcohol and does not smoke and even meditates regularly. Conditions for indian kitchen are not given at all, and the winter is very long and cold indeed. This means host and volunteer have to triumph over mutual cultural shocks and physical difficulties. In order to cope with these problems the volonteer needs helpers. Please note that there is some sensitivity about nomenclature. Some Romas/Gypsies do not like the term ‘Gypsy’ at all, and consider it pejorative. Others identify themselves as ‘Gypsies’ (or rather as ‘Cigány’, the Hungarian equivalent) and do not like the term ‘Roma’. In this and similar documents we have used both terms together, which is the nearest we can come to pleasing everyone. Romas/Gypsies in Hungary are almost all Christians – taking their denomination from the surrounding Hungarian poor people. That means many are Catholics, while some are Uniates (Orthodox Rite Catholics), Reformed (Calvinists), or Evangelical (Lutheran). A rapidly growing number are Pentecostalists. Apart from the Pentecostalists, very little active religious work is done among the Romas/Gypsies, and there are no Roma/Gypsy priests or ministers. The Pentecostal movement is a purely Roma/Gypsy movement and this, perhaps, largely accounts for its present success. Given the lack of active religious work in most of Roma communities, and the lack of any real religious knowledge and understanding, the space is open for Buddhism, especially linked to Dr Ambedkar’s message of social uplift. This is likely to be the case for, say, the next ten years, while we are trying to involve other religious denominations also in this work (for exemple the methodists when setting out secondary schools). The ’Jai Bhim’ network what we have described above, relies on some Gypsy activists who get acquainted with Dr. Ambedkar’s movement in the last three years. The buddhist background has been built on a century-old intellectual orientalist tradition within the Hungarian upper middle class with many books, but without much religious life. Our neo-buddhist work is well introduced in a social context and it is set out in a wide geographical space, but it does not have much link with the buddhist world. We believe that the time is ripe to make steps toward a more serious buddhist presence. The network needs to be organised directly by authentical, trained and experienced Dalit activists.